Home / 2018 / October / 03 / Why don’t we eat turkey eggs? Nathan Pelletier is an ecological economist at UBC’s Okanagan campus and the first-ever Egg Farmers of Canada Industrial Research Chair in Sustainability, awarded by the Natural Sciences and Engineering Research Council of Canada. 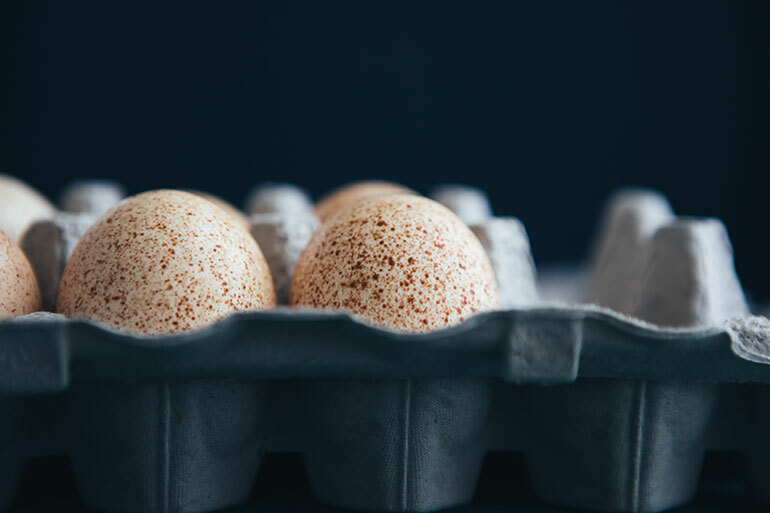 He sat down with UBC Okanagan Media Relations to discuss the reason turkey eggs aren’t more common and the sustainability of eggs more generally. That’s a really interesting question and one that I hadn’t really thought of before. The reason may be primarily about profitability. Turkey’s take up more space, and don’t lay eggs as often. They also have to be raised for quite a bit longer before they begin to lay. This means that housing and feed-related expenses would be considerably higher for turkey eggs compared to eggs from chickens. Since providing feed is also responsible for the largest share of the resource use and emissions associated with egg production, turkey eggs would have commensurately higher impacts, which wouldn’t be great from a sustainability perspective. Is there any reason why we can’t eat turkey eggs? No. They are completely edible. They have a similar creamy consistency to duck eggs and a speckled complexion like quail eggs. I actually think they would make for a very interesting and maybe even beautiful accompaniment to a turkey dinner. I suppose the most difficult part would be finding somewhere to buy them. Why then are chicken eggs so much more common? Again, it likely comes back to the cost of production. Farmers have been improving management strategies for producing chicken eggs in dedicated commercial facilities for almost one hundred years, and there have been genetics programs in place dedicated to optimizing layer hen genetics for productivity since shortly after WWII. Canadians now consume about 70 million chicken eggs annually. What is the ecological impact of producing and consuming all those eggs? Chickens actually convert feed to food very efficiently. It takes about 2 kg of feed to produce 1 kg of eggs, and the average laying hen now produces 300 eggs per year. For these reasons, chickens are an affordable and low-impact source of high-quality animal protein. Interestingly, despite Canadian industry producing roughly 50 per cent more eggs now than it did 50 years ago, my research has shown that, due to improvements in efficiency over time, the resource and environmental footprint of the industry as a whole has actually decreased substantially since the early 1960s. With eggs being such an important food staple for so many Canadians, how is your work helping make egg farming more sustainable? While the industry has come a long way, the question and challenge that now presents itself is how to ensure comparable success looking forward. My research focuses on identifying and evaluating the effectiveness of different management strategies and sustainable intensification technologies that can be applied in the egg industry. Why is sustainability an important issue for Canadian eggs? Sustainability is an important issue for food systems as a whole. The Canadian egg industry adds an estimated $1.37 billion to the economy annually and plays an important role in the diets of most Canadians. As with everything we consume—food or otherwise—searching for more sustainable ways to meet our basic needs and support our lifestyle aspirations is essential to ensuring that we can maintain the conditions necessary to our well-being over time. Nathan Pelletier, ecological economist at UBC’s Okanagan campus and the first-ever Egg Farmers of Canada Industrial Research Chair in Sustainability.